With more than 40 years as a dedicated, family run business, St John's Hearing Aid Centre aim to deliver a high quality, personalised service to the hard of hearing. 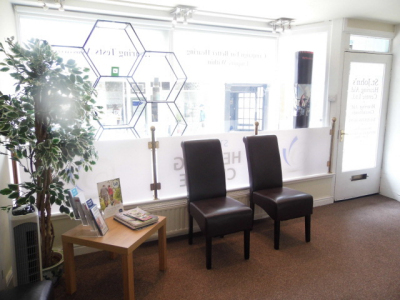 Through our branches in Grange-over-Sands (Cumbria) and Edinburgh (Lothian) and Free Home Consultations in the comfort of your own home, we introduce new customers to the world of hearing aids in a relaxed and pressure free environment. We are experienced in all areas of hearing care and treat every case individually. All our dispensers are qualified and HCPC registered and our aim is to ensure the most suitable solution and best possible outcomes for our clients. We're a family run business, offering a high quality, personal service. All our hearing aids are manufactured to the highest standard by well known international companies, including Oticon, Starkey, Phonak, Unitron, Widex and more. However, by not tying ourselves to one particular manufacturer, we are left free to choose the highest quality at the best prices. We pride ourselves on a personal service and a pressure-free environment, looking for customers who'll stick with us over the years and be happy to pass our name on to others. From our branches in Grange-over-Sands and Edinburgh, our private hearing consultants are ideally placed to serve Cumbria, the Lothians and Fife. With our Home Visits and Free Home Consultations services, we cover Ambleside, Barrow-in-Furness, Carlisle, Dalkeith, Dunbar, Dunfermline, East Lothian, Edinburgh, Fife, Gorebridge, Grange-over-Sands, Haddington, Kendal, Keswick, Kirkby Lonsdale, Kirkby Stephen, Kirkcaldy, Leith, Midlothian, Milnthorpe, Musselburgh, North Berwick, Penicuik, Penrith, Prestonpans, Tranent, Ulverston, West Lothian, Windermere, Workington and more!